Guitarzoo is currently listing this custom build Strat-type by Upstate NY luthier Dominick Ramos. 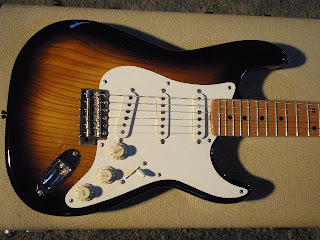 In fact, the listing features a pair of these-- the other a translucent blonde finish. 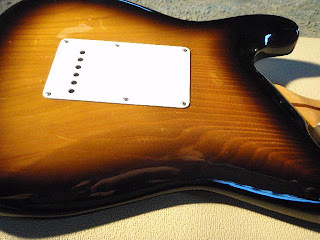 Besides a very cool set-neck approach, this swamp ash body appears to be a single piece! I could be wrong, but staring at the grain, my spidey senses are telling me, "One piece!" 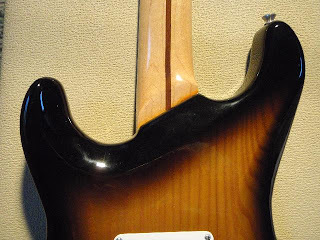 Also looks like a stock Fender neck in other pics, plus a stock F headstock with Fender decals. So, must be a hybrid build. Seller also indicates pickups are made by Ramos. Hey, I dunno much else about these or their builder, but ya gotta appreciate the body wood and neck interface!